Last Saturday I spent a couple of hours at the Boston Arnold Arboretum with the goal in mind to add to my nature photos macro photography gallery. It is one of my favorite photo locations because of its easy access and its diversity in plants and wildlife. Weather-wise it was one of your typical November afternoons with chilly temperatures and high winds. 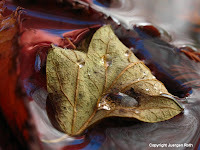 Inspired by my latest tree leaf photography collection addition, taken the week before on my front porch, I was looking for dropped and disintegrating leaves. I stopped at Dawson Pond where the needles of a cypress tree had changed to many colors and the tree canape was fading into the pond. 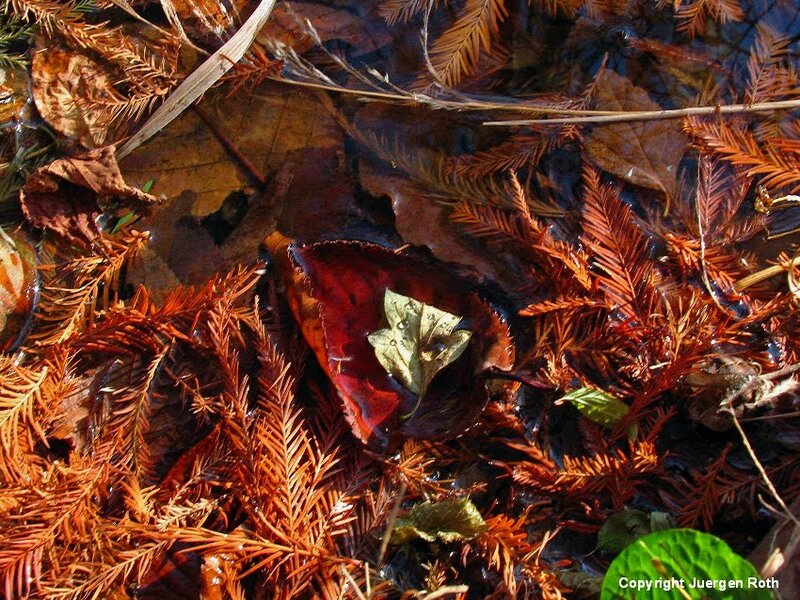 The edge of small Dawson Pond was covered in brownish cypress tree needles, within them occasionally trapped leaves in all colors from other surrounding trees. I looked carefully around the edges of the pond and studied the patterns and photographic objects that mother nature provided. 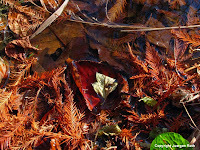 Half way around the pond I stumbled upon a beautiful setting of a disintegrating green leaf captured in a burgundy red leaf ... what a fantastic leaf photos find I thought. Raindrops from an earlier shower were still present and the red leaf was almost fully submerged in the pond. When I lowered my tripod to ground level, one leg half way in the pond, I realized the full beauty in front of me. The tiny wind driven waves were constantly moving the leaf up and down, creating a current that produced wonderful abstractions perfectly framing the main subject. Although near ground level with my camera I decided to explore even lower, more intimate and frame filling perspectives. I detached the camera from the tripod, moved in closer and lower using one of the tripod legs to stabilize the camera. By hand-holding the camera and moving it in closer I finally accomplished the composition I envisioned when I accessed the scenery earlier. The second image here shows the macro landscape as I found it. I turned the polarizing filter to maximum impact and used a kitchen towel to diffuse the harsh early afternoon sunlight. I underexposed by -2/3 steps to bring out and saturate the colors. The camera aperture was set to f/7.1 providing me with an exposure time of 1/30 second. In post processing I had little left to do. I removed any dust spots, applied minor contrast and color saturation corrections before sharpening. Very nice tutorial work, Juergen. Thanks for telling us how you get to these great results! !